MobileTechReview's Lisa Gade is back with a second Lenovo Thinkpad Yoga video review. Here's a link to her earlier look at the device. This time, she specifically covers the performance of the pen and active digitizer, which looks very good. Are you sold? I've seen a lot of mention of Wacom edge tracking issues recently and Lisa addresses the issue by drawing an edge all the way around the screen. But except in those cases where the tracking is so bad that you can't access the file menu or other items in the interface, I believe the importance is somewhat overblown. Since the canvas is not fixed in any graphics application, it's a simple matter to slide a problem corner or other hard to reach spot into the center of the screen if necessary to paint into it. I also rarely draw or work in a 1:1, menu-free set-up like she appears to be doing with Fresh Paint below. Do you? Let me know if I'm out to lunch in the comments section below. Sony Flip PCs ship with 13, 14 and 15-inch screens and optional digitizers. Now that Windows 8.1 is released, the Surface Pro 2 is in the mail and other PC makers are rushing to get new machines out the door in time for the holidays, it's an excellent time to take stock of the options available for Windows artists. The good news is that the list of tablets, convertibles and devices with active digitizers (pressure sensitive pen support) has grown dramatically since the first Surface Pro was released. The challenge now is to keep track of all these new options and the huge variety of configurations and potential "gotchas." I've been wanting to assemble a list like this as a companion to the "What Runs, What Doesn't" feature, but it is a huge endeavor, especially since many manufacturers don't seem to think pen support is all that important. Fortunately for us, a couple of super users at TabletPCReview.com, JoeS and Mesosphere, have been curating just such a list since last summer. The list, which currently details 37 devices with active digitizers, is now also available as an Excel spreadsheet here. Because it's so large, the file is awkward to print legibly. I took the liberty of reformatting it slightly and eliminated many columns in the version below. This is a great resource. I encourage you to check out the complete file and also to drop by the TabletPCReview forums and thank Joe and M. for their efforts. And of course, if you spot any errors or omissions, please let them know. The standard pen that comes with the Surface Pro isn't terrible, though it's a little smaller and lighter than most real-world writing instruments. And even if you can live with its tactile deficiencies, chances are still good that you may soon find yourself in the market for a replacement stylus, given the precarious way that the pen attaches to the tablet's magnetic charging port. Thanks to a couple of tweets and comments from readers, I decided to take the plunge a couple of weeks ago and purchased two replacement pens sold by Wacom. The first is the $39.95 Wacom Bamboo Feel Stylus - Black (CS300UK). 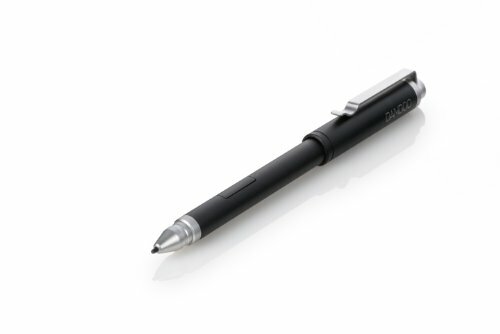 Although it's the same length as the standard pen, the Wacom stylus is much thicker and substantially heavier, feeling much more like a standard pen (9.5 mm in diameter, 131 mm in length and weighs 18 grams). It features a matte finish that is much more comfortable than the Surface Pro pen's slick, cheap feeling plastic finish. The single button is the only ergonomic issue. It's almost flush with the pen's barrel and requires an effort to find and depress. Pressure sensitivity is very good, but the pen nib offers resistance on the screen that may take some getting used to. The feeling is a bit like using a dried fine tip marker. The stylus ships with two replacement nibs. The Wacom Bamboo Feel Stylus is slightly longer and thicker than the standard Surface Pro pen. The $79.95 Wacom Bamboo Feel Stylus - Carbon (CS400UK) is a significant step up in feel and cost. The pen is 1.1 mm thicker, 9 mm longer and weighs 10 grams more. The result is a pen that feels exactly like a fine writing instrument. The most evident upgrade in the Carbon vs. the Black is the reusable packaging. The Carbon ships in a reusable storage case and includes four replacement nibs. Although it ofers less resistance on the Surface Pro's screen, it is still not as silky as the standard stylus. The single button is the same as on the Black. It's very easy to miss on the pen's surface. Although I expected to prefer the finish on the Carbon, I actually think the Black's less slick finish feels cooler to the touch. If you're cost-sensitive, I'd recommend buying the Black and saving the $40. But if you want the best available for now, the Carbon is an excellent option. UPDATE: Batman '66 artist Jonathan Case offers an excellent review of the Bamboo pens here. The Bamboo Stylus feel - Carbon is significantly larger than the standard pen and its Black cousin. Windows tablet users rejoice! The newly released Wacom feel IT driver brings long-awaited pressure sensitivity to Adobe Photoshop, Corel Painter and other graphics applications. Although the post on the Wacom site doesn't specifically mention the Surface Pro, I confirmed that it works as promised. The driver isn't limited to the Surface Pro or Windows 8. 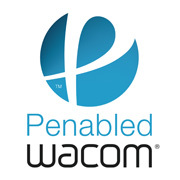 According to Wacom, "This driver should be installed on tablets that have Wacom feel IT technologies or Wacom Pen based technologies. This driver will also support older Penabled Tablet PCs running Windows 7, Windows Vista, and Windows XP Tablet Edition." If you're running penabled tablet using one of the operating systems listed above, please let us know if you run into any problems. After downloading and installing the driver, Windows 8 configuration requires accessing the desktop control panel. 1. Swiping with the pen to open the charms bar does not work while some classic graphic applications are maximized on the screen. To get swipe functionality back with the pen, minimize the graphic application, or tap the pen in the Windows taskbar area. Swipes with a finger will continue to work normally. 2. Some sleep and resume issues have been observed. 4. In some classic graphics applications, pressing the pen side switch will immediately activate a right click without touching the pen tip to the screen.